Last month here on Guitarz we looked at a bass from Argentinian luthiers Lanzi Instruments, namely the Lanzi Mk1 Rick Bass which takes the famous Rickenbacker 4000 series bass design as a starting point and boldy updates it for the 21st Century. 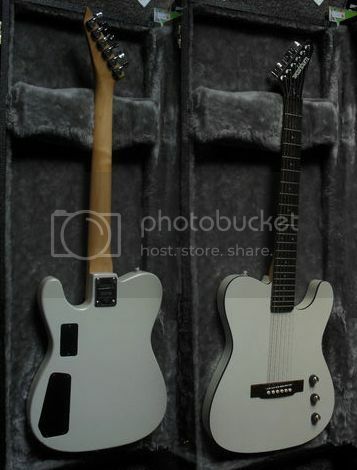 Here we see a left-handed Lanzi Telecarla W. Herrera Signature model in gloss white, which takes Leo Fender's classic design for a certain 62 year old guitar and updates it in the same way that the Rickenbacker design was updated for the MK1 Rick Bass. 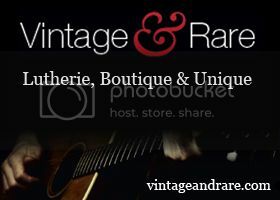 This guitar is currently available for sale via Vintage and Rare - please enquire for a price. And if anyone knows who W. Herrera is, please enlighten the rest of us! 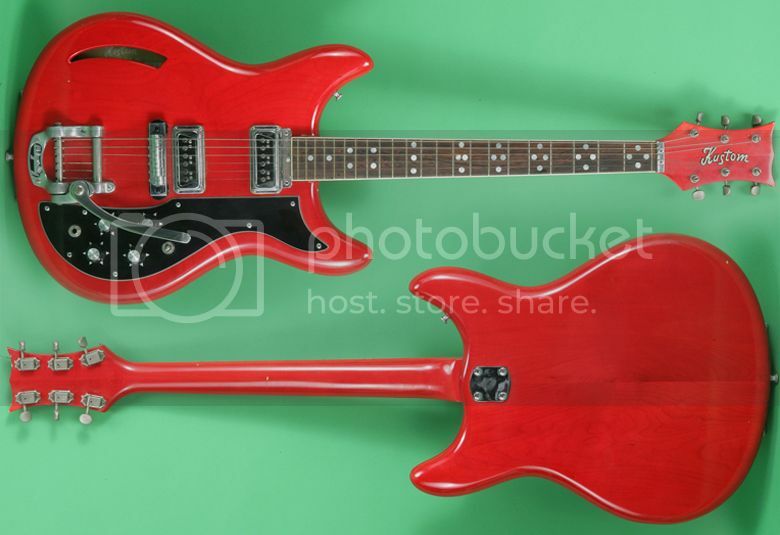 This guitar is a real oddity. 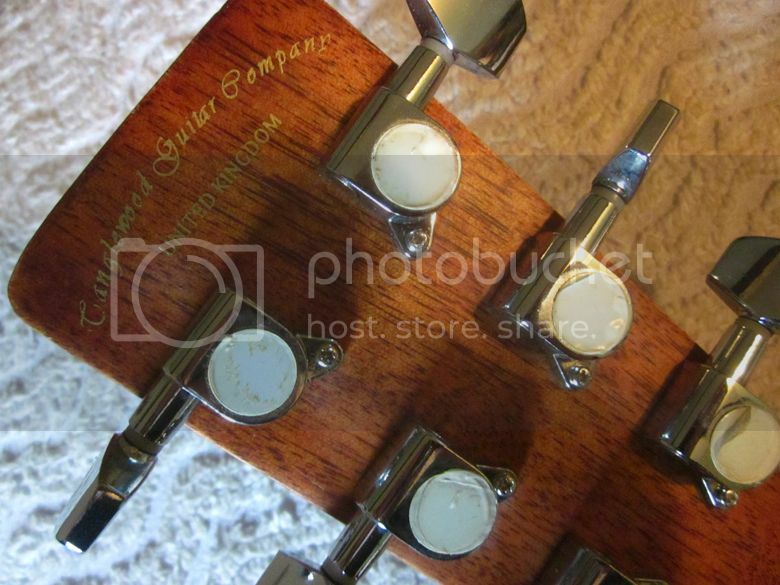 You cant but help noticing the distinctive Gibson logo on the headstock, but the body is totally unlike anything that Gibson ever built - plus of course it's been fashioned out of clear acyclic. 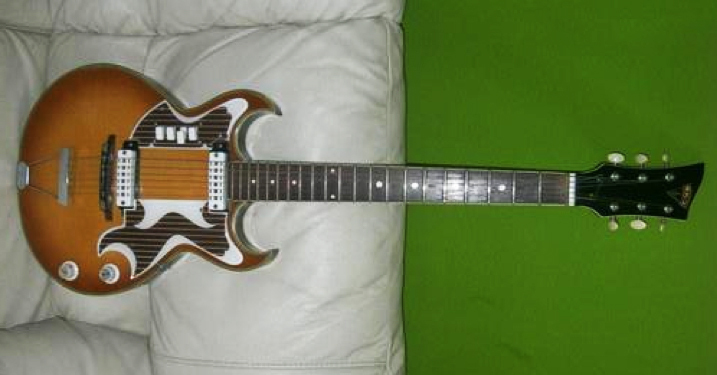 Of course, it's not a Gibson at all, well other than the neck, that is, which was taken from a 1970s Gibson SG. It does beg the question of what happened to the original SG, but looking closer at the back of the neck you'll notice that the headstock has suffered a break in the past so it might be a safe assumption to say that the original guitar suffered some considerable damage - perhaps through some ghastly accident or possibly at the hands of a Pete Townshend wannabe. 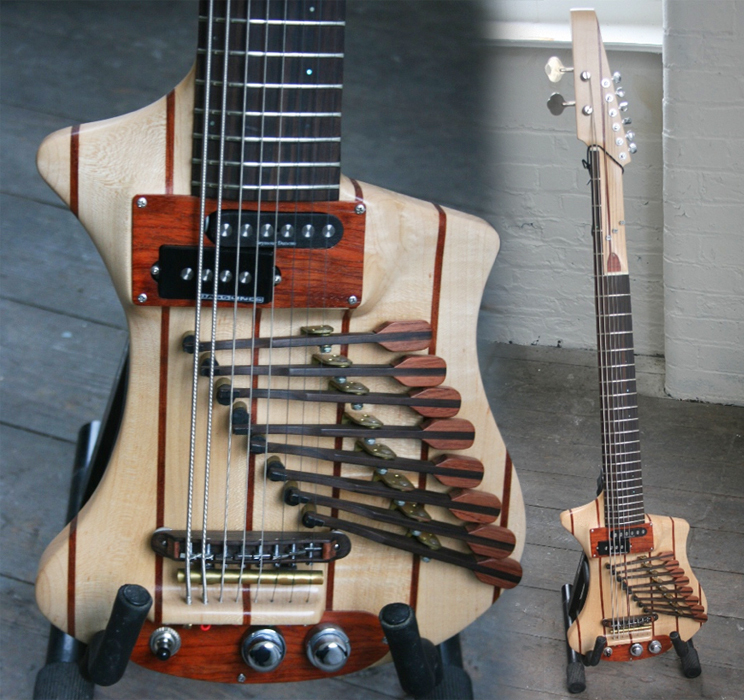 Although I've got a bit of a "thing" for acrylic bodied guitars, I can't decide whether or not I like this one. The body design is rather mis-shapen; in fact it reminds me of a melting ice sculpture, but maybe that was the intention. 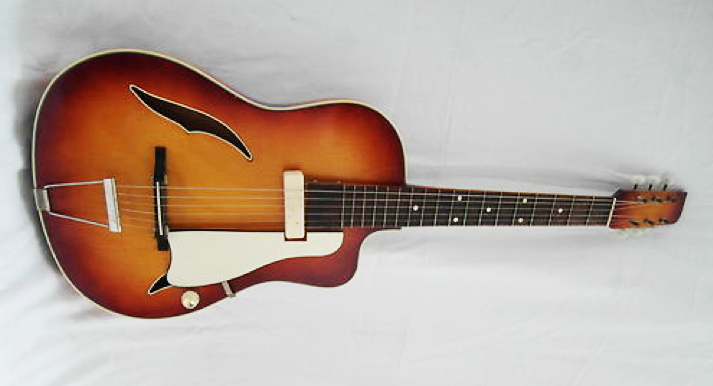 Part of me thinks it should have been made to look more Gibson-like in keeping with the provenance of the neck, but another part of me applauds the maker for doing something different with the design. 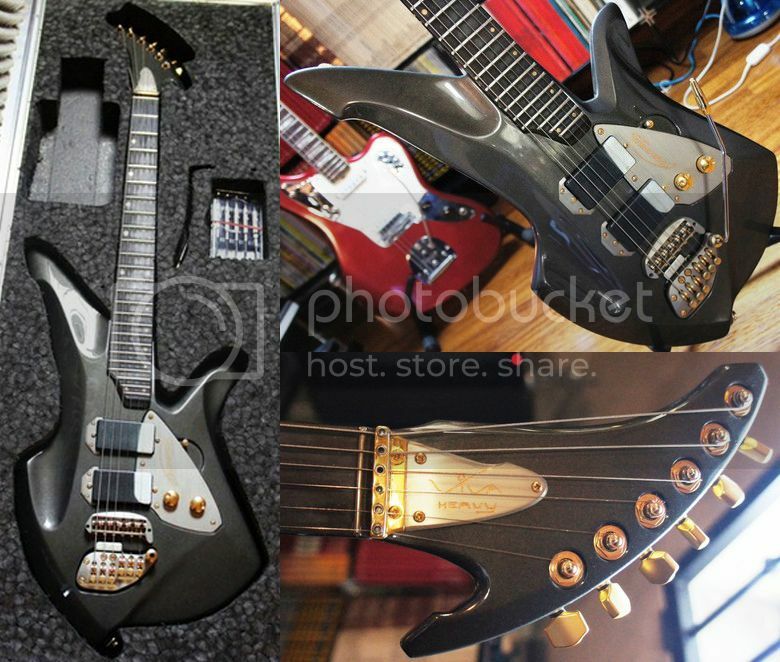 This guitar is currently listed on eBay with just over a day left before the end of the auction, currently has no bids and a starting price of $499. Here's another apparently "pickup-less" solidbody, this time it's a Fender Stratocaster Classical from Fender Japan. It's equipped with piezo pickups in the bridge saddles and is strung with nylon strings. I'm really curious to know what those nylon strings sound like with the Strat tremolo. It's not something that classical guitar usually calls for, although I doubt this would be used for playing classical guitar upon anyway. 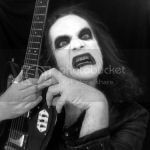 It's more an instrument for the rock guitarist who's after the nylon strung sound for certain particular songs. The seller thinks this may be a one-off or a prototype, although I think this is doubtful. 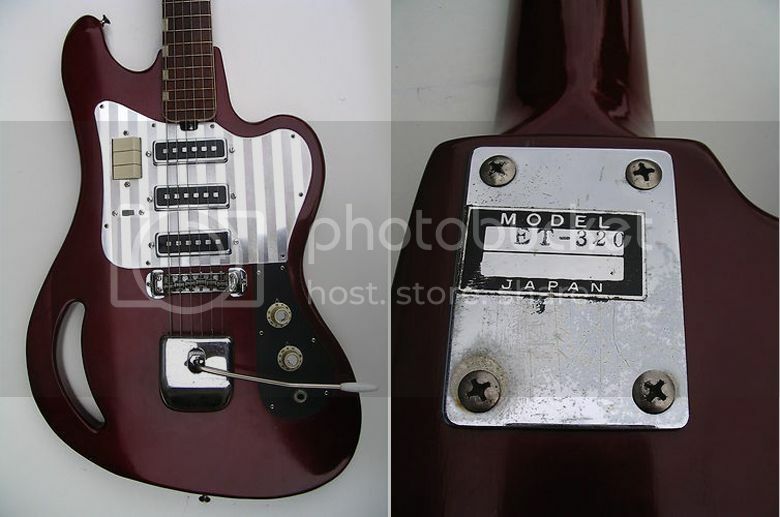 It's most likely a Fender Japan model that was not made for export outside of Japan. "Là tout n'est que luxe, calme et volupté..."
I know, I've shown a few 620s already here and this one has nothing special but its JetGlo finish that, combined with white binding and pickguards and chrome gear, emphasizes its perfect outline - but my fascination for this guitar doesn't wane a bit! 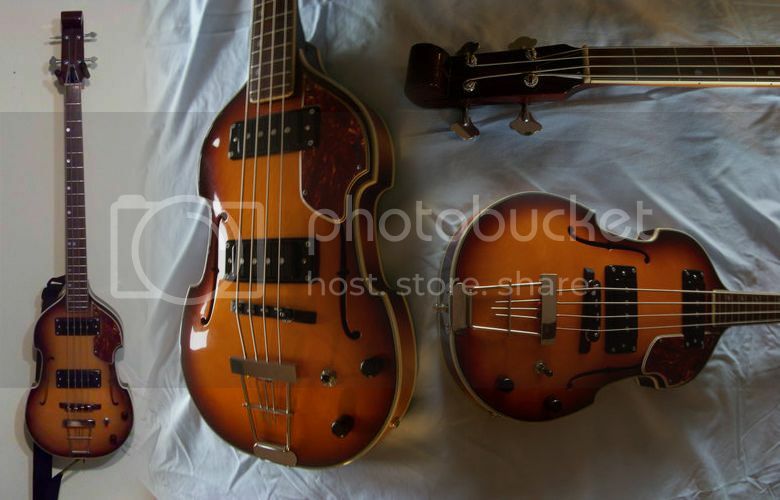 Can you identify the mystery doubleneck guitar / (very) short-scale bass? 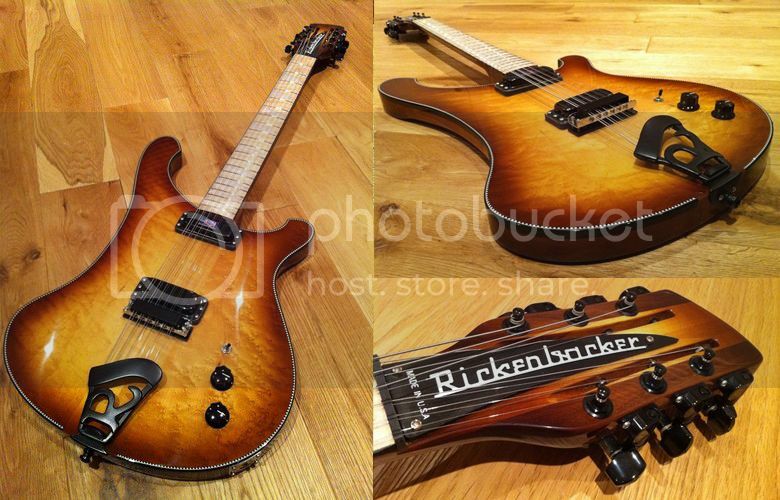 Guitarz reader Jeff brought this mystery doubleneck to my attention. 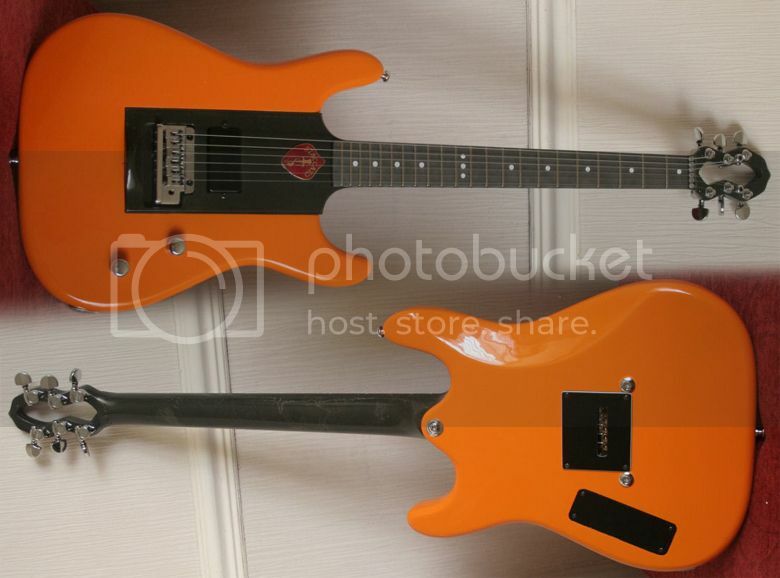 It's currently being offered for sale on eBay with a Buy It Now price of $649, although the seller is completely in the dark as to what this guitar/bass combo actually is. 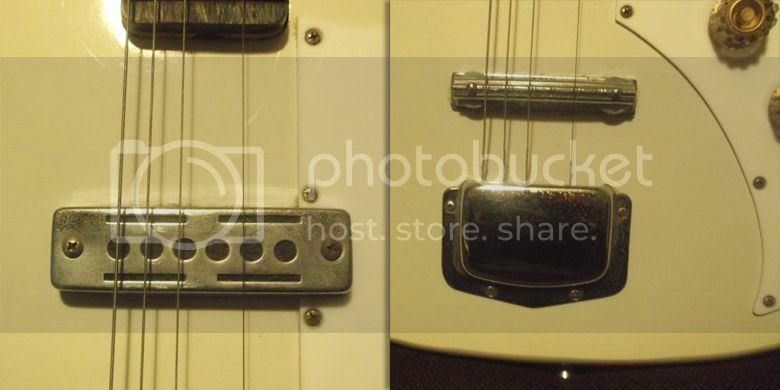 Apparently the pickups are made by Framus so it would be a perfectly reasonable piece of guesswork that the whole guitar might be made by Framus, but the seller claims to have checked with Framus who have responded that it's not one of theirs. Jeff suggested to me that it has the looks of a Carvin to it, and I reckon he might be onto something there. Can any of you guys identify it more conclusively? 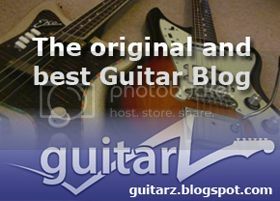 Labels: bass, Carvin, doubleneck, Framus, mysterious guitar, vintage guitars, What's that guitar? ORVILLE GIBSON’S "STYLE 03" GUITAR BEING ONE OF OUR FAVE GUITAR DESIGNS with its anthropomorphic visual and its experimental crafting method made it the most exotic vintage guitar in our eyes – some kind of mythical piece of craft, a milestone in Guitar History. This gave us the guiding conceptual direction for our "Phaeton". As explained by Lewis Williams in the first 1903 catalog "front and back made in swelled shape by being carved, leaving the layer grain of the wood in the same position as in its natural growth, thus insuring strength, free vibration, and unusual sympathetic resonance" or "special relatedness and agreements of parts”. In all its forms, car styling aesthetics are obvious here, from the two tone color scheme to the sound – holes bearing air intake visual reference, the whole thing breathing our love for the golden years of American Car Design. The "Phaeton" name has always been synonymous with class and luxury in the automobile history. If you're interested in owning your own Tao Phaeton, contact the seller via Vintage & Rare. AS far as I was aware Rickenbacker do not offer one-off or custom shop versions of their guitars and basses, but here we have a factory one-off Rickenbacker 481/12 in a stunning walnut finish, made in August 2011. I guess it's some kind of prototype or experimental model. It has a "bass shape" 4002 body married to a 660/12 neck with unfinished maple fingerboard, and is currently listed on eBay UK with a Buy It Now price of £3,995. 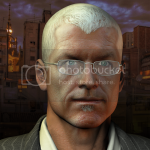 My name is Jimi Cullen. I am a musician from Ireland. 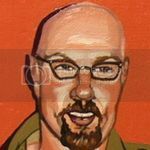 I have been following your blog now for some time and absolutely love it. 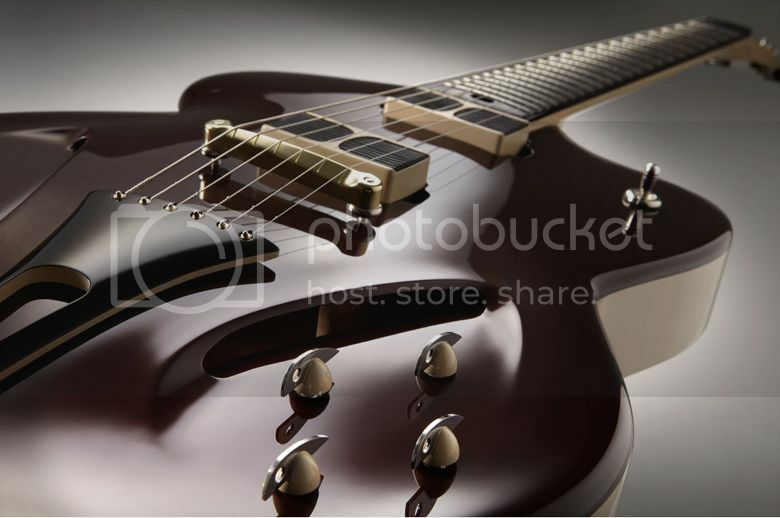 It's really great for building ideas as well as identifying unusual guitars. I have spent many hours looking through all the great stuff. Thank you. The other day I picked up a guitar that I have been unable to identify and cannot find on the blog. I was wondering if you knew anything about it. 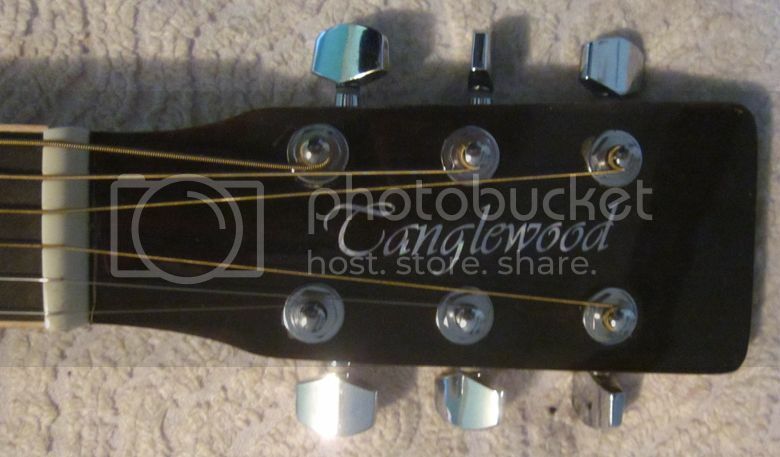 The name on the headstock is New Sound but I'm not sure this is the original neck as there is a small gap at either side of the neck pocket so it may be a replacement. It's the body that I'm really interested in. Have you come across one before? Of course I may be mistaken about the neck and it may belong to the body. 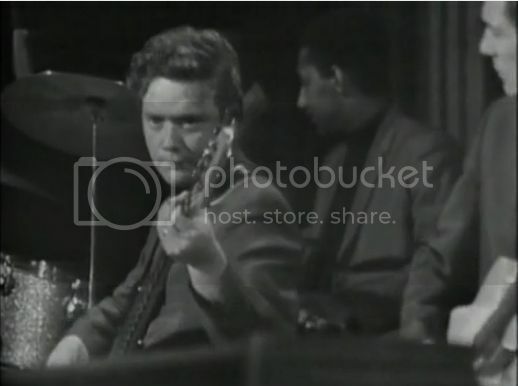 Hi Jimi, I think we can safely say that your New Sound would have been a "budget" guitar back in the day. 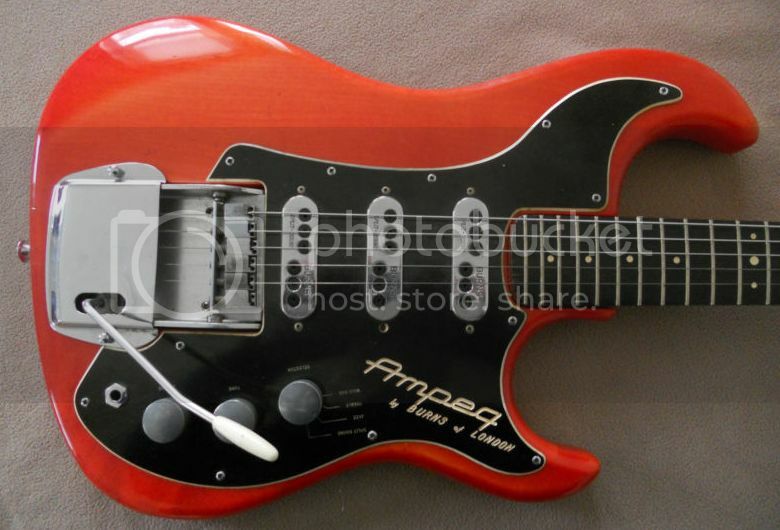 The single pickup is very similar to that appearing on the cheaper Teisco and Kay guitars. I'd wager also that the neck was original - they were rarely a snug fit in the neck pocket on these cheaper guitars. I'm not really able to say much more about it (because I simply don't know) but let's throw the question open to the Guitarz readership? I don't know who would play such an instrument but I'm sure that it could ravish some young guitarist - you could learn to play on much worse! 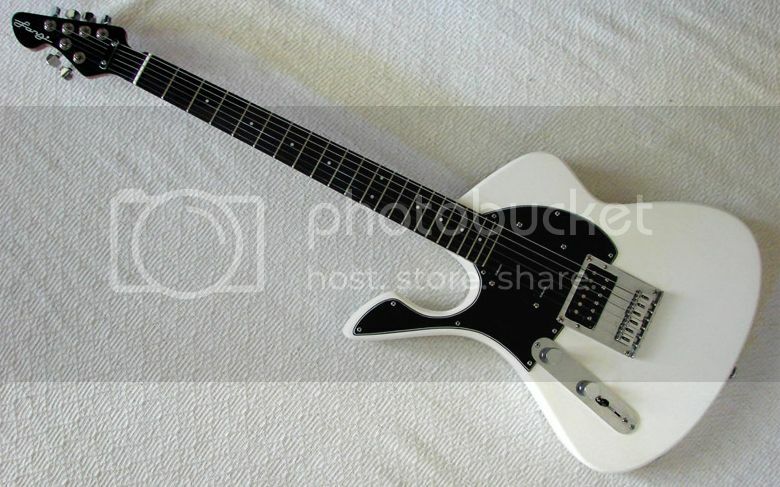 Another (not too) crazy Wandre guitar, the Polyphon has a design based on the Brigitte Bardot hollow-body model (lots of curves), an aluminium neck with 6 in-line tuners headstock and all the other unique Wandre gear - pickups, suspended bridge, tremelo... This one doesn't have big square switches like other Polyphons but more regular knobs, but there were always many variations in Wandre's series. It also sports both the Davoli brand and the Krundaal K-logo - Davoli Krundaal was the amplifier brand of Athos Davoli who made the electronics and pickups of Wandre's guitars, it was used also for the Bikini guitars with embedded amps, then it turned into the Davoli guitar brand, so it probably tells that it's an early model from an undecided time... An ultimate internet database on Wandre guitars is still missing! 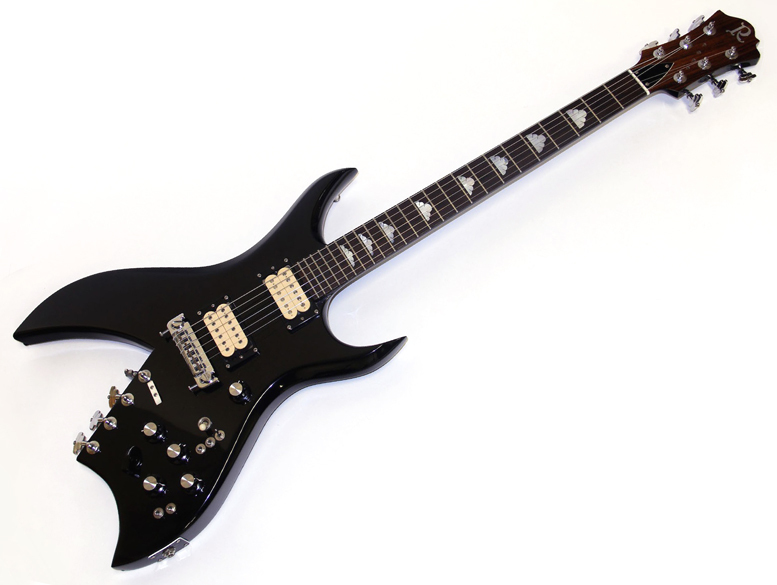 One of my favorite guitars ever is the 10-string Bich by BC Rich, with double four higher strings for rich harmonic sound and single lower ones for heavy riffs... Designed by Neal Moser in 1977, it's part of the early BC Rich models that were so cool and so good at proposing alternative designs after the 1960s creative boom waned and had left rock musicians with 4 or 5 dominant guitar designs... Moser also created its electronics - there are plenty of knobs and switches as you can see, to split, boost and phase the humbuckers, plus a varitone à la Gibson, for a wide range of sounds. This Washburn SBT-21 is a Tele-style guitar with a pointy 1980s-style headstock and looks like it is a relation to the Washburn Tour 24 Tele. At first glance it would appear to be an electric guitar with no pickups, but the acoustic style bridge is a dead giveaway as to its true function - of course it has piezo pickups under the bridge saddle. I guess this was designed for (hair) metal bands who just couldn't bring themselves to use a proper acoustic guitar for live shows (which wouldn't look "metal" enough, or some such nonsense). These days a guitar such as this is more of a curiosity than a practical versatile guitar. 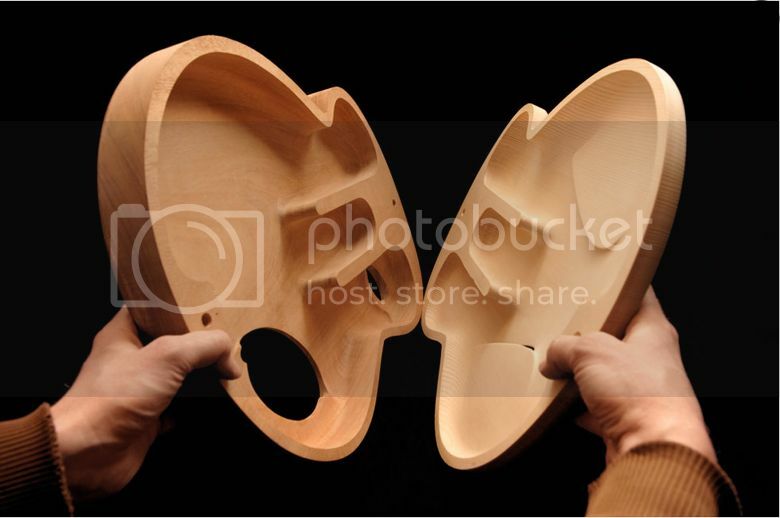 As a "solidbody acoustic", it's neither one thing or the other. Electric players will want a guitar with magnetic pickups, whilst those wanting an acoustic sound would be better served with a genuine acoustic or - if they must - electro-acoustic guitar. Now, if this guitar had magnetic pickups in addition to the piezos, then it could be a truly useful hybrid instrument. 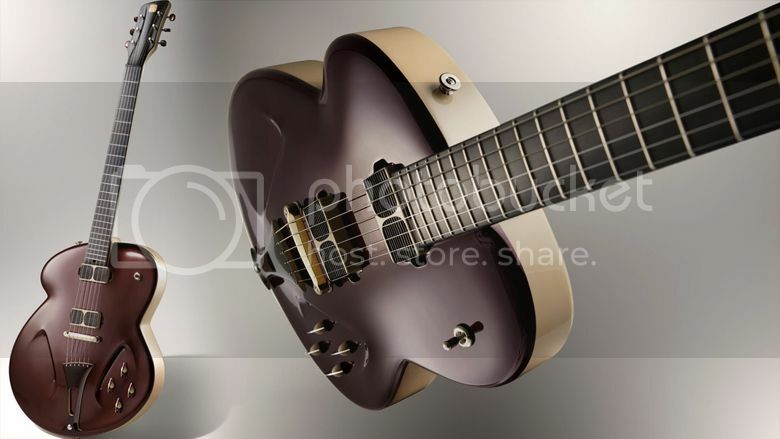 Having said that, the pickup-less solidbody look is quite cool, and thank goodness Washburn didn't stick a faux soundhole on it and place slider volume and tone controls on the upper rim. 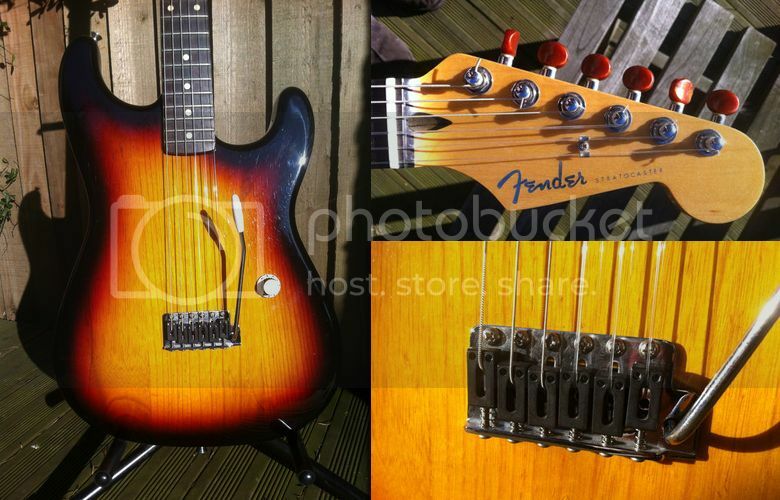 This guitar is currently listed on eBay UK with a starting price of £180 and a Buy It Now price of £300, which seems quite reasonable for a not too common 1980s-era Japanese made guitar. Alas, as explained already, it is an instrument of limited appeal; unless. that is, you are the occasional guitar strumming singer of a hair metal band wanting a guitar for those cheesy power ballads. I guess that this sawn-off and relic-ed Squier Strat is one of those love it or hate it modifications. 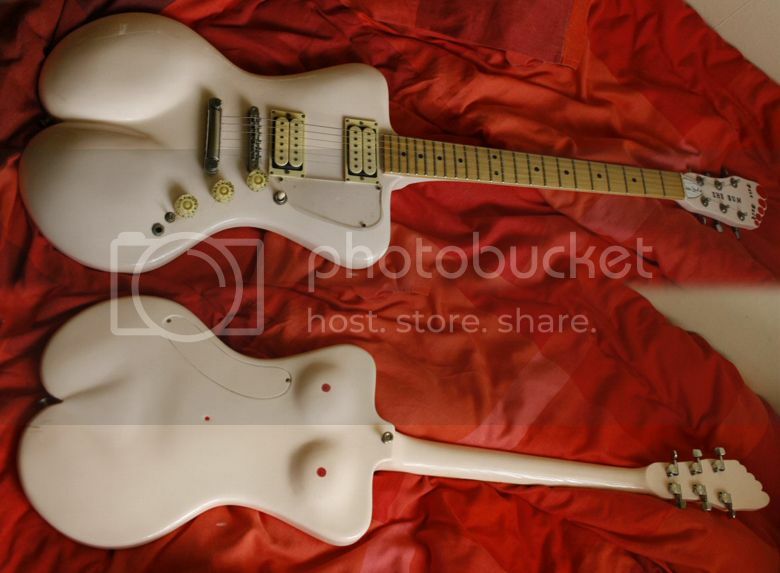 Compared with John Mayall's own modified Strats, the body surgery is actually quite conservative. This guitar is currently listed on eBay UK with a Buy It Now price of £295. 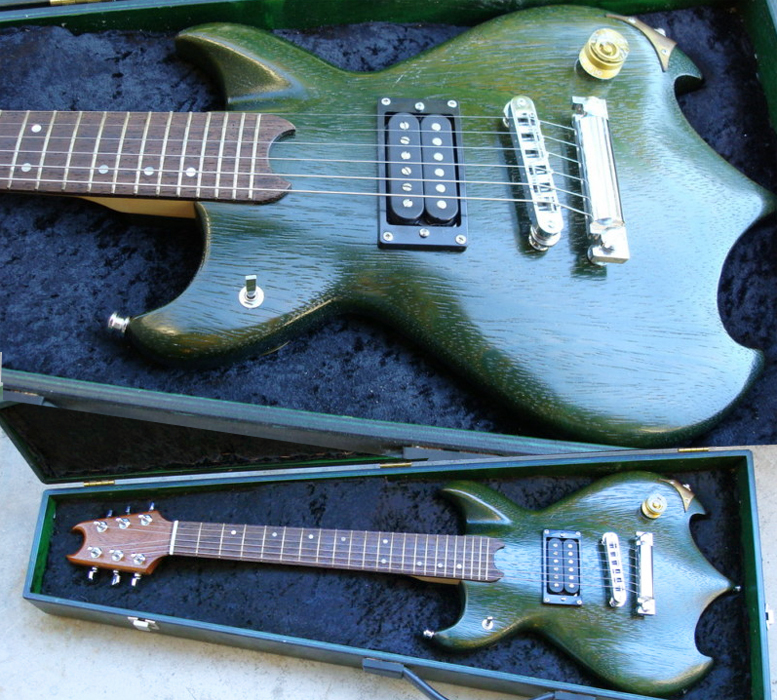 Here's a guitar from a maker which we are not used to seeing turning up on eBay with any kind of frequency. 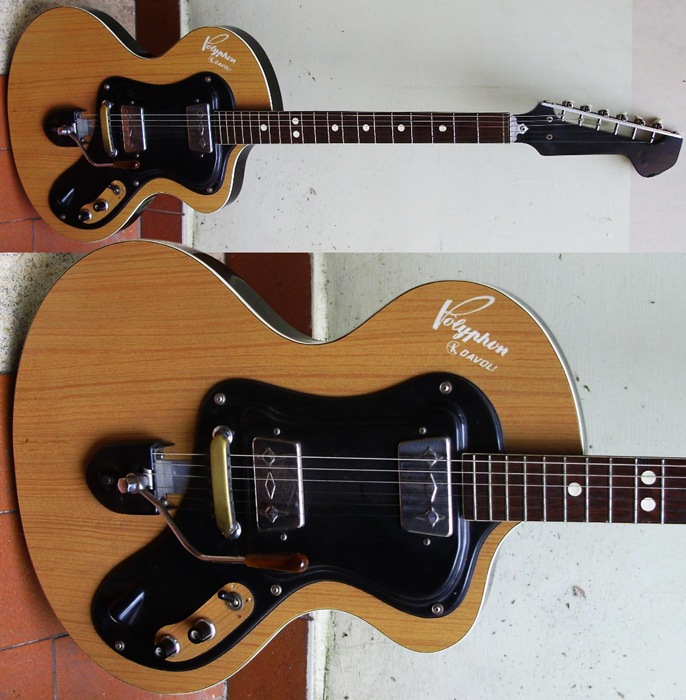 It's an Auerswald Instruments Viva, numbered 12 in a very limited series. Auerswald guitars and basses are boutique instruments handcrafted in Germany by Jerry Auerswald, and used by the rich and famous, people like Prince, U2's Adam Clayton, and Chico Hablas ("Who?" you may ask. I've tried finding out more about him myself, for he played one of my favourite ever guitar solos on the song "Desire" by Yello - other than his work for Yello I know nothing about the man). 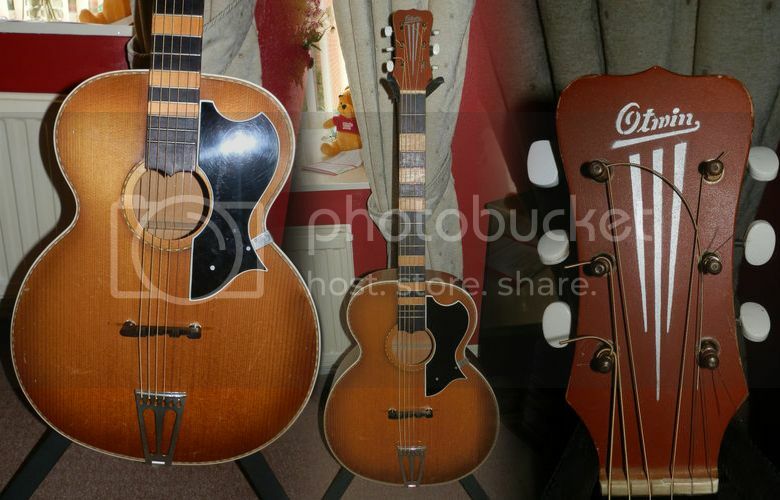 This particular Auerswald guitar looks positively normal alongside some of their other designs (see for yourself at www.auerswald-instruments.com). Note the use of proprietary hardware rather than the same generic parts seen on, well, just about everything these days - and with a price tag when new of approx $40,000, I should think so too! 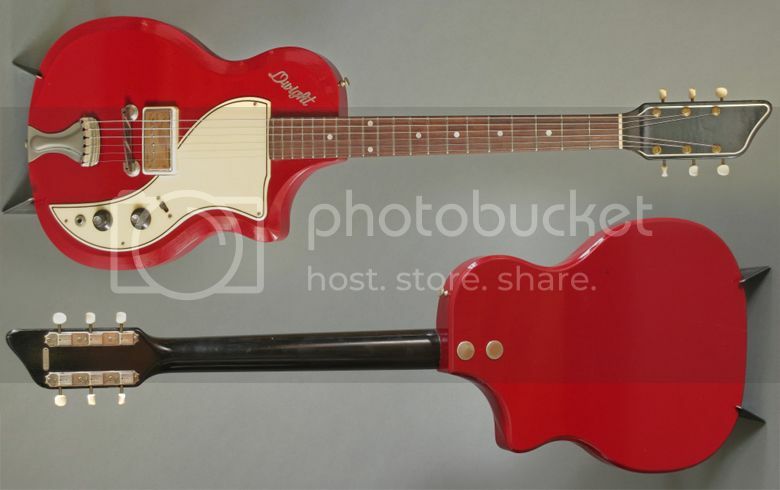 However, you could snap up this particular example for a fraction of that price, as this guitar is currently listed on eBay with a Buy It Now price of $10,000. 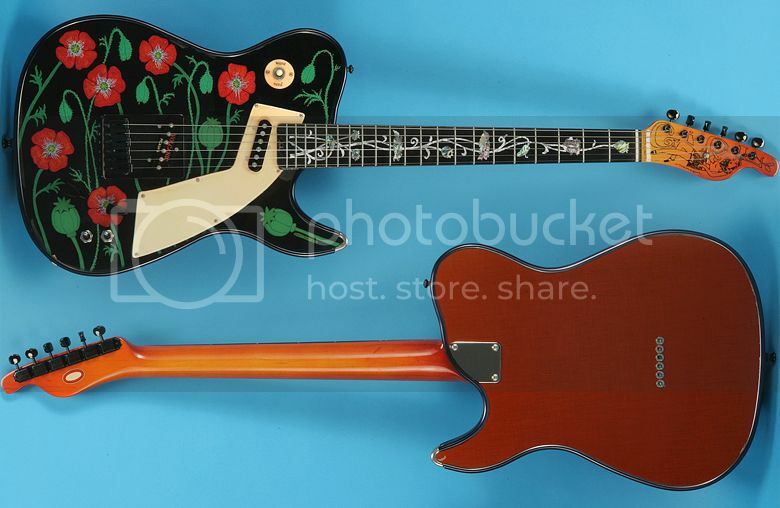 This Girl Brand "Opium Girl" guitar is quite appropriate for this time of the year when the poppies have started blooming. (Incidentally, our poppies here in Pembrokeshire in South West Wales are yellow rather than the more usual red). Girl Brand guitars are one-off works of art by luthier Chris Larsen of Arizona, and as such do not come up for sale very often in the usual guitar marketplaces, however this example from 2002 is being offered for sale by Jay Rosen Music in the USA via Vintage & Rare. Although the Telecaster influence is obvious, the body is actually of a hollow construction, formed from an aluminium rim supporting top and back plates. These vary from one individual Girl Brand guitar to the next and can be made from materials as diverse as formica, rusted steel, plastic laminates, street signs. 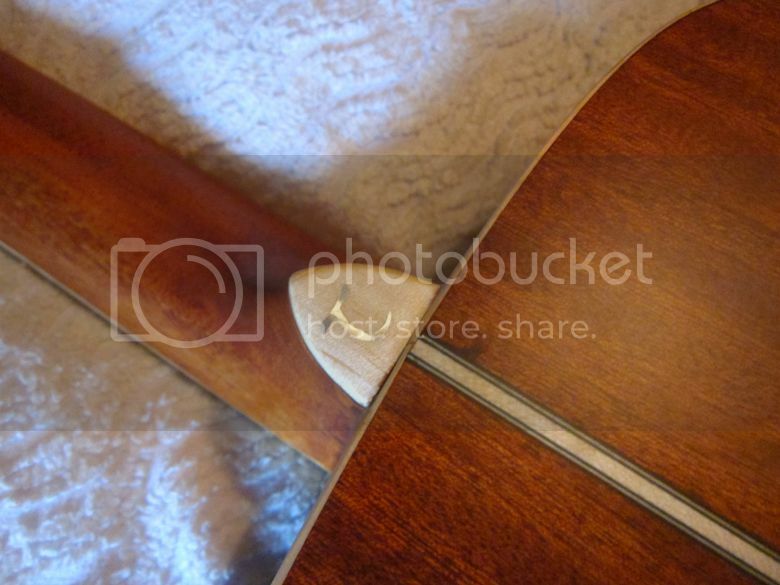 Some examples even feature windows in the top of the guitar allowing you to see objects placed inside the guitar body (depending on the "theme" of the particular guitar). This particular example is priced at €2854 / $3695. Contradictory to my passion for the guitar, I am also a big fan of electronic music and in particular Kraftwerk. I've often said that my ideal band would be like Kraftwerk with guitars (perhaps something like Neu!, and come to think of it might also explain my fondness for Devo), so I take great delight in this version of "The Model" by Danish instrumental covers band Tremolo Beer Gut. We've previously looked at a Staccato bass here on Guitarz and today we're taking a peek at this Staccato guitar, one of the lesser known 6-stringers that they made, which - compared with the bass - is a much more conservative almost Strat-like design too. It's one of just (approximately) 200 such instruments built between 1985 and 1987 by Pat Townshend in partnership with Chris Jagger (yes, the brother of a certain other Mr Jagger). 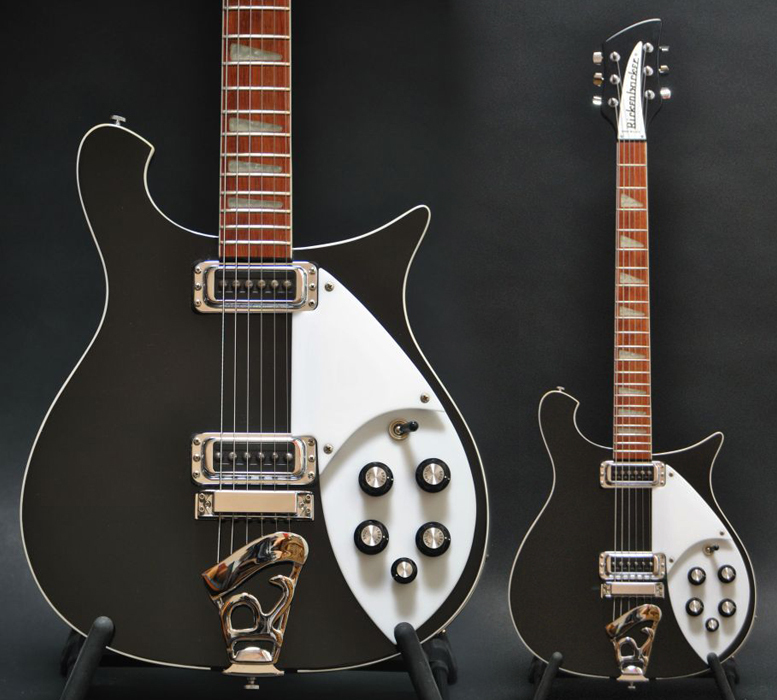 As well as the unusual choice of materials used (magnesium alloy for the so-called interchangeable neck - which actually encompassed the centre body section too - and fibreglass for the body), the main innovation behind the Staccato was the ability to swap and change necks. I can't see that in a performance this would be any more convenient than swapping a whole guitar, but there you go, at least this company was trying something different. This Staccato guitar is currently listed on eBay UK with a starting price of £599. Can anybody tell more about it? 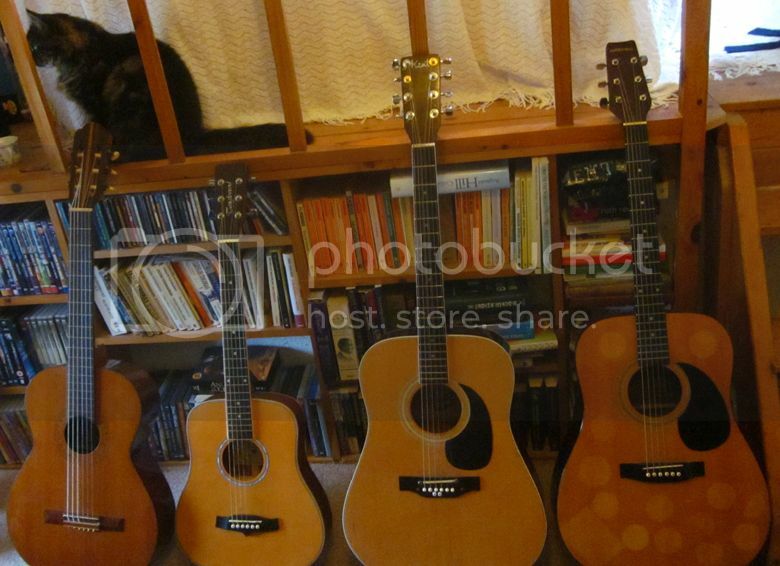 Labels: German guitars, Semi Acoustic, vintage guitars, What's that guitar? 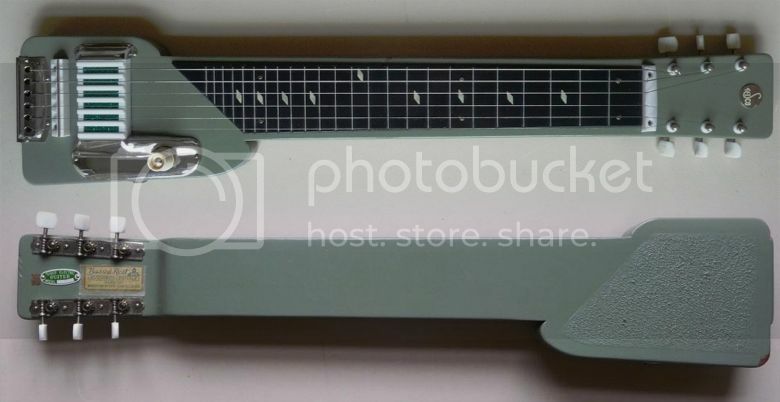 This guitar - a Teisco Model Z lap steel from 1965 - is about as simple as they come: slab-bodied, single pickup, single volume control, but I find it absolutely fascinating. 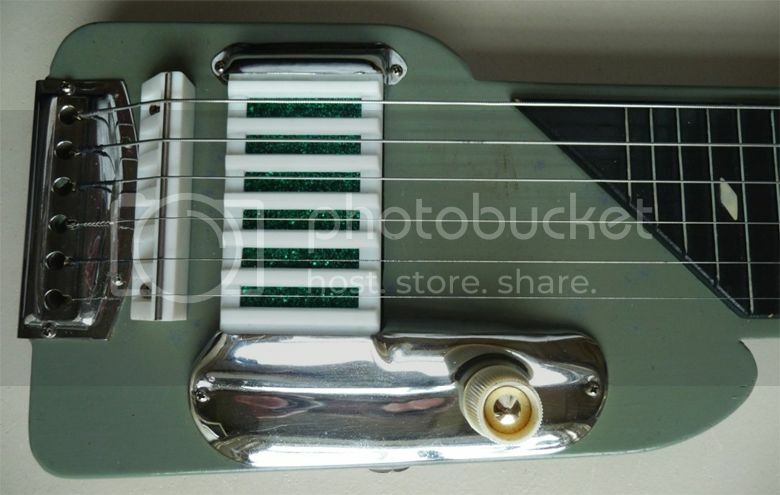 I've not seen one quite like this before but that grey-green colour is a typical Teisco finish. 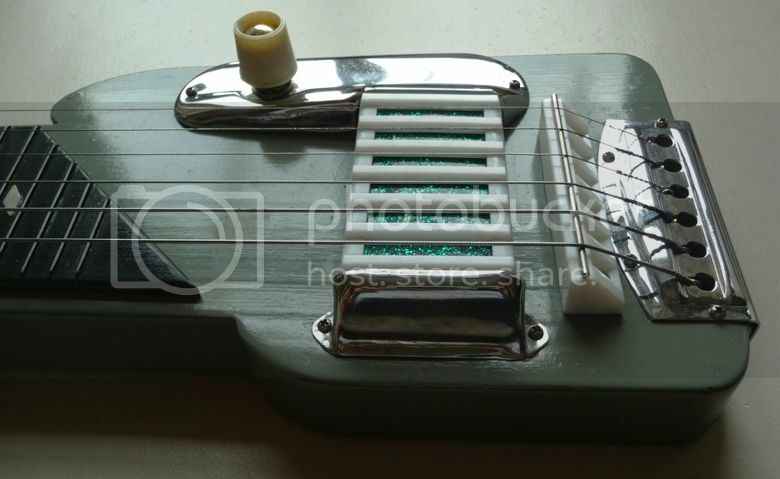 Note how the plastic-bodied pickup is not only inlaid with green pearloid but also appears to be "scalloped" with channels for each of the strings. I also like the contours of the metal components: the tailpiece, panel carrying the volume control, and the little pickup bracket. 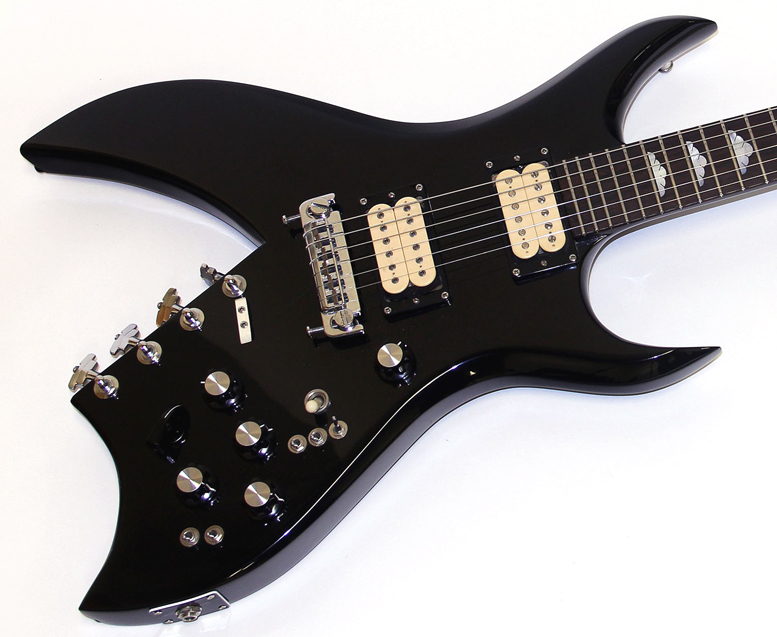 Compare this with modern lap steels with use generic bridges and Strat-like single coil pickups. Note also that the fingerboard appears to be inlaid with real frets which is unusual on a lap steel where the only function for frets (or fret-lines as on most examples of this type of instrument) is as visual markers. 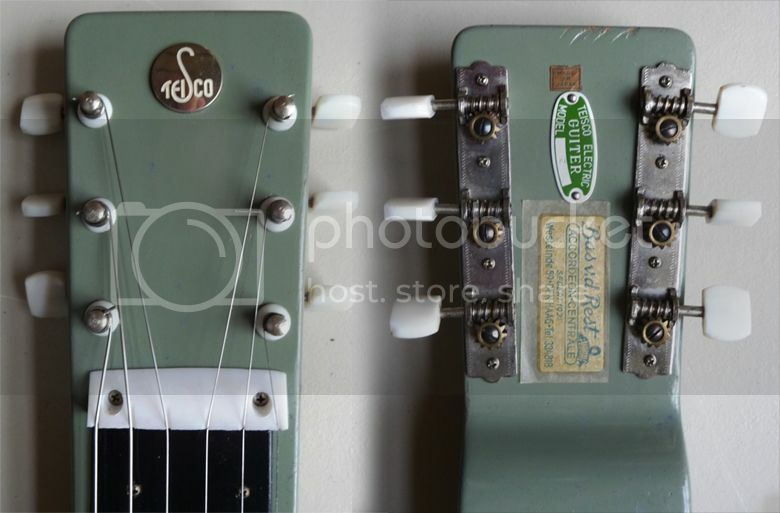 I love the Teisco label on the reverse on the head complete with a mis-spelling on the word "guitar", and also the label from an accordion retailer where this lap steel was originally purchased. The guitar even comes in its original hard case, and is available for sale via Vintage & Rare for a very reasonable €250. Do you really need me to say anything about the guitar pictured here? It's currently being offered for sale on eBay with a starting price of £599 - which is pretty decent for a quality luthier-built one-off guitar. 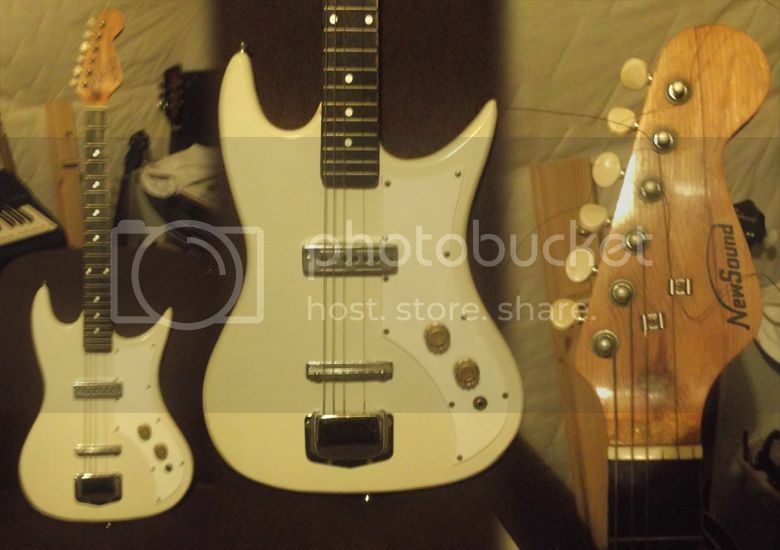 As the seller suggests, it would suit a glam or Spinal Tap-type band (yeah yeah, we know "Big Bottom" ought to be played on a bass). 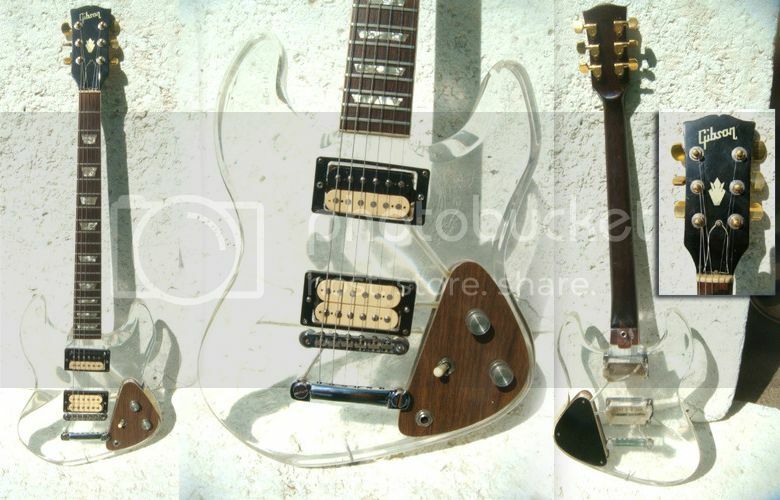 Check here for more of Pete Back's guitars. Tanglewood Evolution TB Baby has teething problems ... any suggestions? 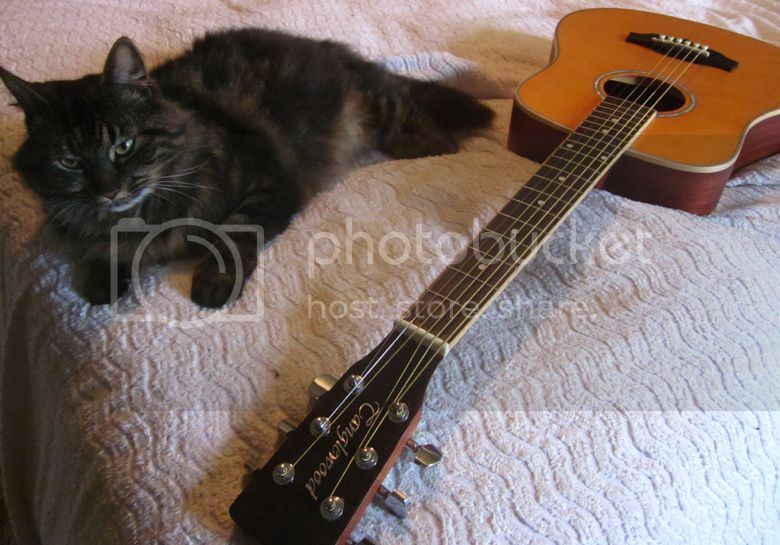 Please forgive what may look like a gratuitous photo of my cat, Elsa, but her appearance here does help to put the size of this Tanglewood Evolution TB Baby acoustic guitar into perspective. 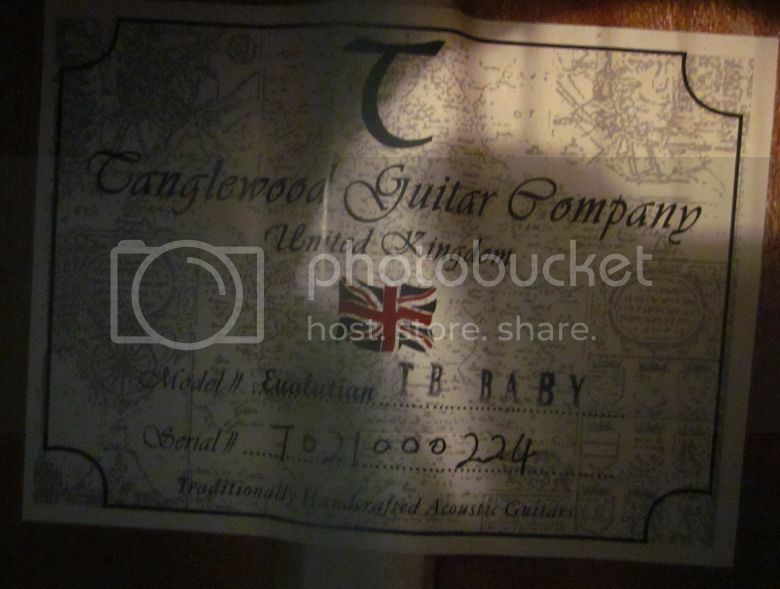 This is Tanglewood's answer to the Taylor Baby. With a scale length of approx 22 3/4", the TB Baby is intended as an acoustic travel guitar, but despite its small size it is a quality instrument as I hope these photos help illustrate. I bought this particular Tanglewood Evolution TB Baby recently; it was brand new but I got it for about a third of the normal retail price. However - as is often said - "there's no such thing as a free lunch". In other words, there's a good reason why I got it so cheap. 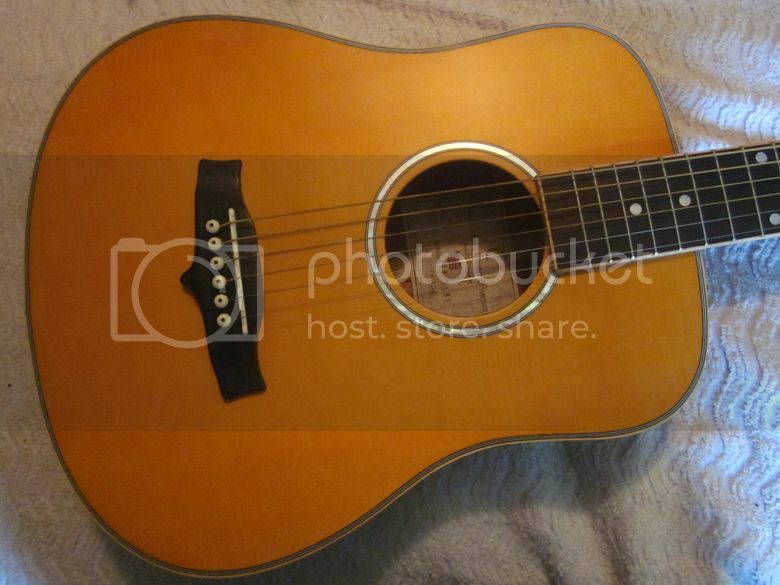 It has a cedar top, mahogany back and sides, and mahogany neck with rosewood fingerboard, attractive maple binding and an abalone soundhole rosette. 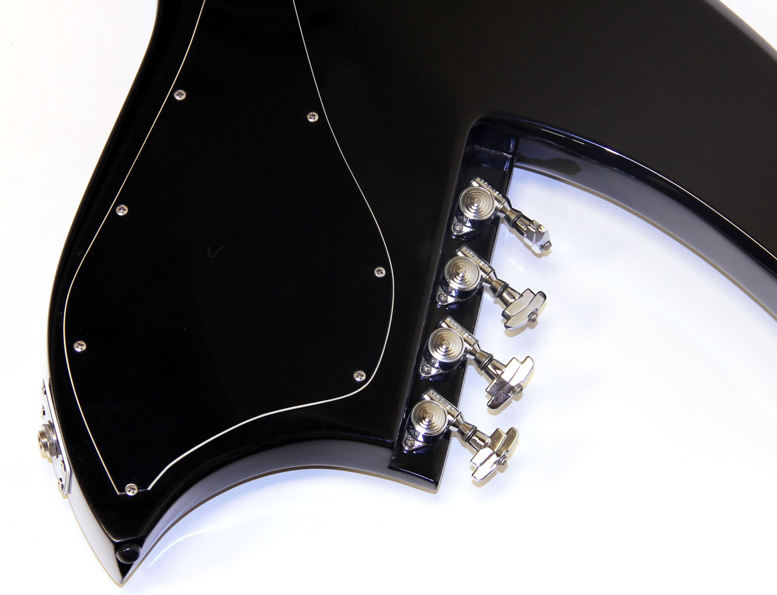 Check the detail on the heel of the neck (below), with the abalone Tanglewood "T" set in a heel-cap of maple. It's actually a very sweet sounding guitar, with a very pleasing tone, quite unlike that of a full size dreadnought. Unfortunately, this guitar has issues. As I believe is often a problem with short-scale guitars such as this, the intonation is way out. At first I wondered if the bridge saddle had been inserted the wrong way around, but I have checked it and it seems fine. What I am not so sure about, however, is the fretting. 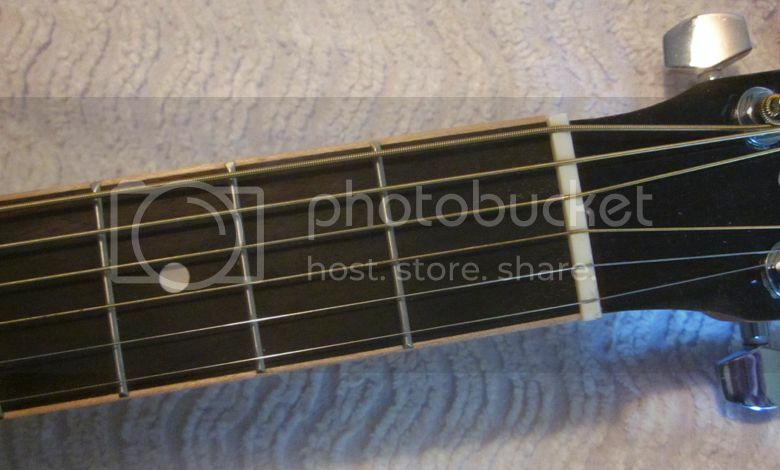 I don't know what you think, but to me the distance between the nut and the first fret appears to be too large for the scale being used here. Take a look at the photo below and see what you think? 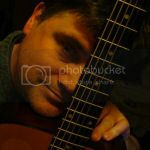 I have tried playing with a capo at the 1st, 2nd and 3rd fret positions and it does perform a little better - you can actually play so that the guitar manages to play in tune with itself. Even better, I found, is to tune the guitar up a semi-tone and then use a capo. However, this is far from ideal because it means that we're having to deal with an even shorter scale and are being forced into playing in keys we might not want to play in. Anyway, the guitar is - supposedly - designed to play in standard tuning. If I was forced to keep in permanently in another key, just tuning it up a semi-tone seems hardly worthwhile. Tuning up to G would seem more useful, but when I tried tuning up to G, the tension on the strings was just too much. Different gauge strings might be an answer, but then again they may intone just as badly. Try the guitar with different gauge strings and see if a different tuning helps. However I'm almost convinced that this option will not bear fruit because I very strongly suspect that the intonation problem stems from the incorrect distance from nut to first fret having been used (my experiments with the capo would seem to confirm this), but it has to remain a consideration. Try the guitar with nylon strings which are known to be much more forgiving when it comes to intonation. And - yes - you can get nylon strings with ball ends nowadays, but the nut slots would need widening. Get someone competent to install a (tall) zero fret or maybe some kind of compensating nut such as an Earvana (although I'd prefer not to pay Earvana prices). So, it looks like it's a case of either spend money on a bunch of different kinds of strings to see what works, or else spend money with a luthier or guitar repairer. Does anyone have any further suggestions? 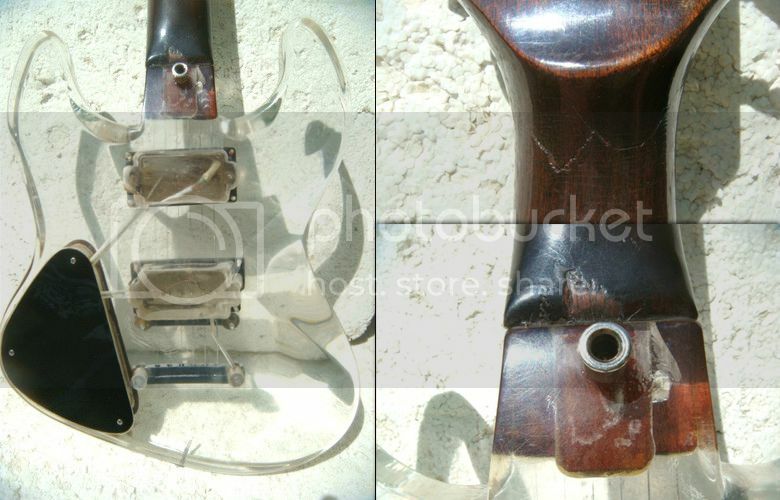 Or maybe you have had intonation problems with a guitar like this? Please let us know via the comments below.